The 50th legislature of the Student Government Association (SGA) convened March 27 for its last legislative session to discuss three bills on chartering and the SGA budget following the University-wide referendum that split Student Government into two autonomous branches. All three bills passed unanimously with 13 votes. SGA Vice President of Finance Jason Yu (17B) presented Bill 50sl32 and called for approval of the SGA Administrative Budget for the 51st Student Legislature. The SGA Administrative Budget “provides administrative funding to the SGA Executive Board for running the SGA itself and SGA programs or events,” according to SGA’s Finance Code. The proposed $27,458.80 administrative budget is 24 percent lower than the 50th legislature’s administrative budget, which stood at $36,130. The budget reflected a reduction across all spending categories to account for the loss of graduate funding. Yu also presented a financial report of undergraduate divisional councils funded in Fall 2016. 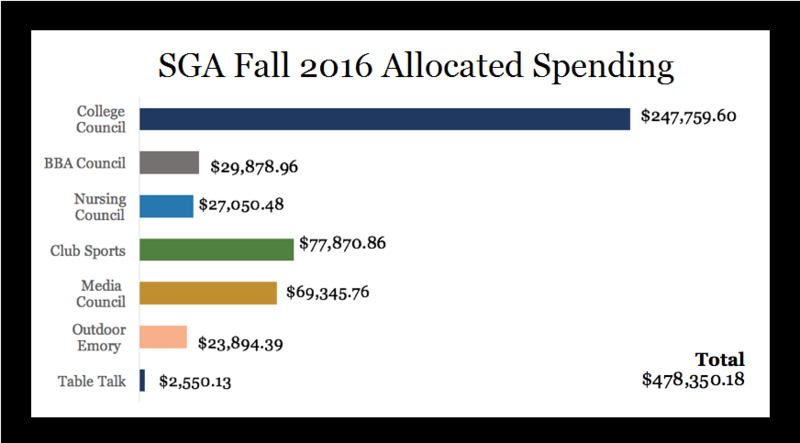 College Council spent $247,759.60, BBA Council spent $29,878.96 and Emory Student Nurses Association (ESNA) Council spent $27,050.48. Under the University-wide Organization (UWO) umbrella, Club Sports spent $77,870.86, Media Council spent $69,345.76, Outdoor Emory spent $23,894.39 and Table Talk spent $2,550.13. SGA ultimately approves both divisional council and UWO budgets, but divisional council budgets aren’t subject to as strict of a review process, Yu said. Divisional councils use their allocated funds at their own discretion, and spending is “pretty standard year to year,” Yu added. Bill 50sl31, also presented by Yu, called for the temporary suspension of two sections of the SGA Finance Code to avoid breaching its laws: Part V, Clause 21.3.1, which states “All deadlines and the Operational Budgeting Process must be before the SGA elections” and Part IV, Clause 19.1 of the SGA Finance Code, which states that any changes to the SGA Fee split must be made at least 30 days before the date on which operational budget requests are due. According to Yu, SGA is unable to fulfill those requirements in wake of the government split. UWOs are unsure of the amount of funds they will be receiving from the graduate divisions as the SGA and Graduate Student Government Association (GSGA) undergo negotiations, leaving it impossible for SGA to complete a budget on time. Additionally, the General Finance Timeline, and Part IV, Clause 19.1 needed to be suspended to account for fee splits that will take place next month under the new government structure, Yu said. Bill 50sl30 called for the creation of an “Executive Agency” designation and charter to replace the “University Wide Organization (UWO)” designation outlined in Article 3 of the SGA Chartering Bylaws, and was submitted by SGA Attorney General Christopher Lam (17B). The bill proposed the terminological change as SGA and GSGA now share control of UWOs under the Joint Governance Committee (JGC), which has yet to create a contemporary definition of the term. According to the bill, an executive agency “must demonstrate to the Legislature that it is logistically unfeasible for the organization to carry out their mission under an undergraduate divisional council,” and is subject to yearly review by the SGA. The bill acknowledged that TableTalk and SPC both “primarily serve undergraduate students,” and granted the organizations their Executive Agency Charters. The new charters replaced their classification as UWOs and puts them under the governance of the SGA, although future organizations seeking the Executive Agency label will be subject to majority approval from all undergraduate divisional councils in addition to the SGA legislature. “To speed up the process since [SPC and TableTalk have] shown they’ve been capable of catering to multiple divisions, we are forgoing the process of having the four undergraduate divisional councils [vote],” Lam said. The legislature also unanimously approved a charter of The Emory Poker Club after finding that they met all requirements under the SGA chartering bylaws, including acquiring a minimum number of 10 members.